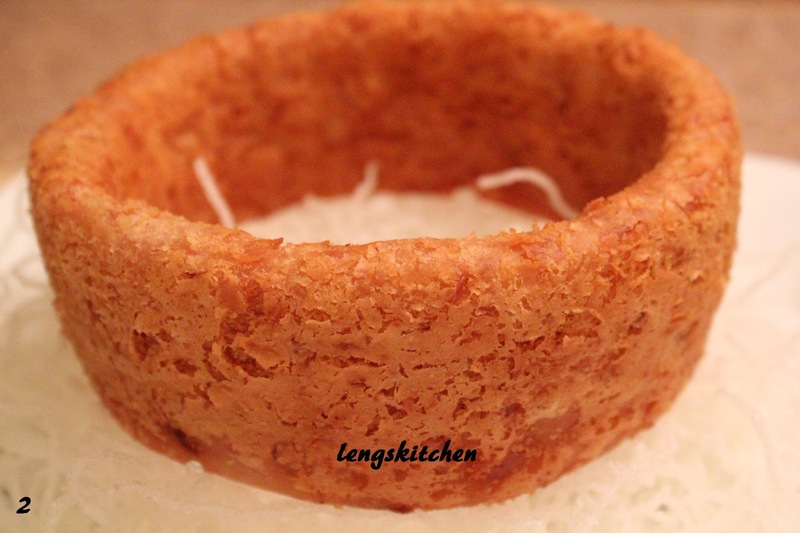 I probably won't call myself a big fan of yam, but the crispy yam ring is one that always gets my attention whenever it gets served on the table. There's just something really attractive about it. I'll attribute the attractiveness first to its appearance in general; it looks like a basket from an angle and a circular wall from another. But regardless of what it truly represents, having it served along any center dish of your choice will never fail in heightening the overall presentation of the dish on the whole. As you dig into the dish first by tearing down the wall surrounding the dish, it reveals within itself the soft mashed yam coated all over by a thin layer of crispy and flaky skin. And then you move on to the overflowing dish at the center with part of its protective wall now breached. The kung pao chicken has always been my choice. 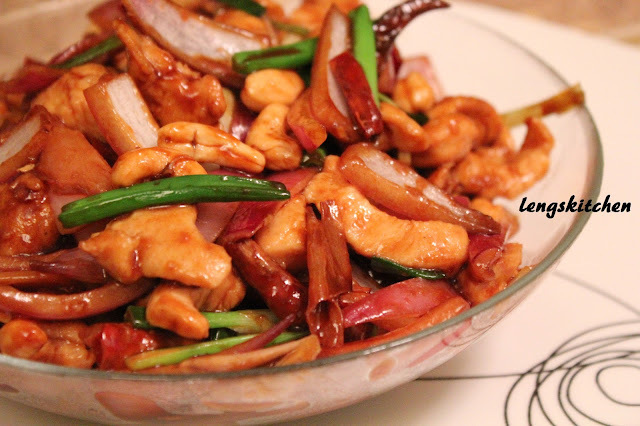 With the mild and natural flavor from the yam ring, the kung pao chicken adds a little spice and kick with its fiery dried chilies and its ginger-garlic-and-onion accented flavors. And right beneath all these is a bed of crispy glass noodles lightly deep fried to perfection; they stay crispy until they start getting drenched in the savory gravy coming from the kung pao chicken. Drooling yet? Well I am! lol. SIZE There is not a specific size as to how big or small the yam ring should be. But the two things you probably should take into consideration is the number of people you are serving, and of utmost importance to me - the size of the wok, pot or the deep fryer you are using. Go for one with a moderate size (less oil needed to fill them up) and with a good depth if you could; getting the whole ring fully submerged in the hot oil is always easier than having to do them first in half and then inverted to get to the other half - less time, less hassle and less risk of them falling apart. THICKNESS The first time I made this, it was one with a relatively thicker wall. Not that they are bad. They actually tasted great! But for someone who is all head over heels with especially the crispy nature these yam rings have, I made a mental note to have it done slightly thinner the next time. Thinner - just so that the crispy skin:yam filling ratio gets slightly higher lol. So depending on your personal preference, the thickness is all up to you. If having it thin is your cup of tea, make sure that they are thin but not too much that they lose their stability when formed into a ring. TIME Making this involves a good hour of chilling the yam ring to let the shape set. And the good thing about this? You can start really early anytime in the day and just let the yam ring sit in the fridge until cooking time. DEEP FRYING Unless you are using a deep fryer with a basket easily lowered into the hot oil, deep frying this yam ring can be quite challenging a task. You wouldn't want to just drop the whole ring into the oil; the bottom gets burnt easily when it comes into direct contact with the pot/wok and lifting the fragile yam ring when it is done will be even tougher a job. You can use a sieve yes, provided the pot/wok is large enough to accommodate them both. So do plan ahead and look for a method that best fits you. I had mine laid out in the recipe part. 1. Peel the yam and cut them into chunks. 2. Bring the yam chunks to steam in a steamer basket for 15 minutes until soft. Remove from heat, transfer to a bowl and mash the yam using a potato masher. 3. Place the what starch in a bowl. Bring some water to a rapid boil. Measure and add 10 tbsps of hot boiling water to the wheat starch. Spend a little time mixing it until the water is well incorporated. Add this wheat starch mixture, salt, shortening, sugar and the 5-spice powder into the mashed yam. Mix with the potato masher until they are well combined. 4. Separate the dough into portions. Again me and my OCD - I'll have the dough weighed and divided into 3 equal portions. 5. With each portion, roll, flatten and shape the dough into a strip using just your hands - thickness depending on your personal preference and length according to the size of the yam ring you are aiming for. Stand the strip up (make sure it is stable) and connect the ends. 6. To make the deep frying easier, I have the yam ring rested in a handmade basket made out of the aluminium foils. The idea came from the original recipe in which Sinner had used an aluminium pie dish with some holes made. I just tweaked it a little making my own basket with layers of foils. And to make lowering and removal a little more easier, I secured two opposite ends with the butcher's twine just so I can hold them safe and sound. Place the yam ring into the basket and leave to chill in the refrigerator for at least an hour. This is when you can pack and bring the extra yam ring(s) to freeze for future consumption. 7. Before serving, fill a pot or wok with enough cooking oil for deep frying and bring to heat. Make sure that the oil is well heated. As usual, I have it tested with a wooden chopsticks. A steam of mini bubbles seen and it's ready, let it heat for another minute or two otherwise. Lower the heat to medium. Carefully lower the basket with the yam ring into the oil. Let deep fry until the yam ring turns golden brown on the whole. 8. Carefully remove the basket from the oil, drain, and let rest on a wire rack. Let it cool down lightly before gently and carefully transferring the yam ring out of the basket. 9. To make the crispy glass noodles, spread and separate the glass noodles a little before bringing them into the same pot/wok of hot oil. They will puff up instantaneously. Remove and let drain on a sieve. 1. Marinate the diced chicken with the meat marinade (adding in the cooking oil last) in advance. Leave refrigerated until cooking time. 2. Heat a skillet on high with half the cooking oil. Once well heated, turn the heat down to medium-high and add in the diced chicken. Stir and toss until the meat starts changing color. Drizzle in the water, cover and let simmer for about 5 minutes. The chicken should be well cooked at the end of it. Dish out and set aside. 3. Bring the skillet back on high with the remaining cooking oil. Once well heated, add in the ginger, garlic and dried chilies and stir fry until aromatic (the dried chilies may get a little pungent). 4. Add in the red onions next. Keep tossing until they get slightly wilted. 5. 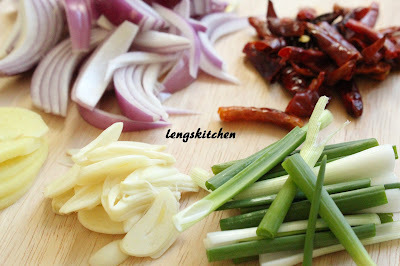 Bring back the chicken into the skillet followed by the spring onions. Stir to mix well. 6. 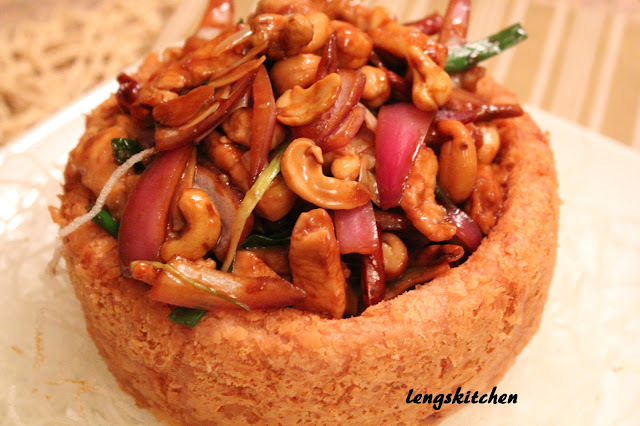 Add in the roasted cashew nuts followed by the gravy. Stir to combine everything well. The gravy will start thickening in a matter of seconds. Dish out and set aside. 1. 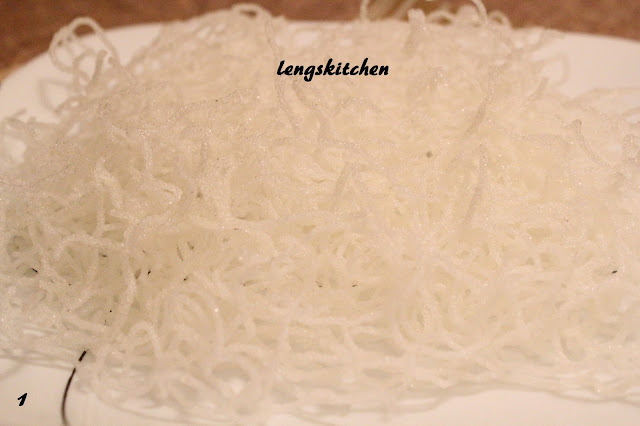 Spread the crispy glass noodles on a plate, forming a bed. 2. Place the crispy yam ring on top of the bed right in the center. 3. 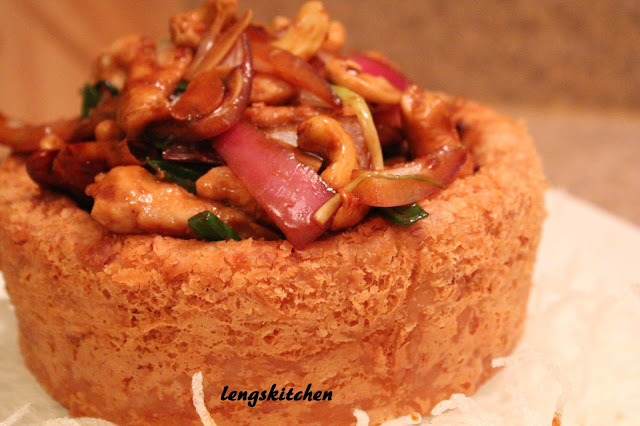 Spoon in and fill the yam ring with the kung pao chicken. Serve hot. Your yam ring turn out so beautifully. I tried making this once but the yam basket went out of shape. I just drop the whole Yam ring into the oil without making the foil ring. Hi there! You're most welcome :) It's so great to know that it worked out perfectly fine for you and your mom! You totally made my day! :)I'm not good at doing it without the foil really - I'll get all panicky (and clumsy) that it may either fall apart or get overly browned especially at the bottom :p Well, thanks for the great feedback! 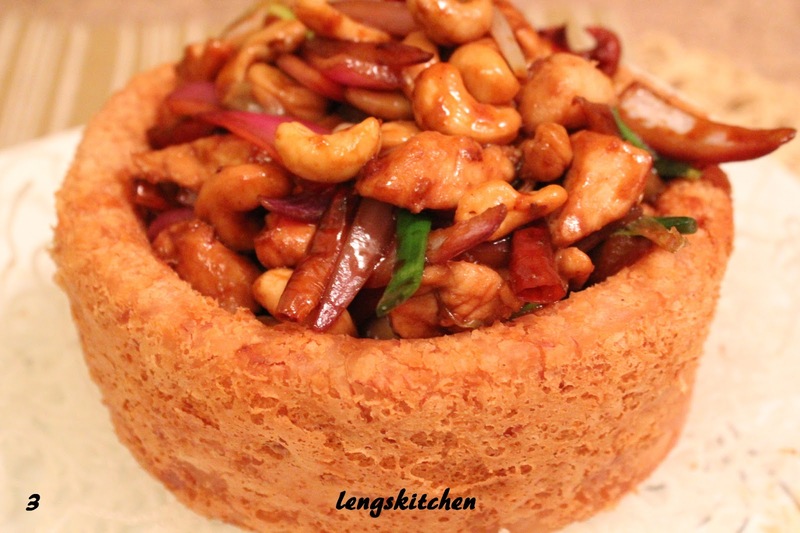 Really love this recipe, this is the 1st time i make and my family really love it! I'm fried it without using the foil ring and the shape come out perfectly. Hi, 2 times already i making this yummy yam ring. My family and my friends really love it and everyone said it taste really good. Thank you for your yummy recipe. Is the yam quite hard to mash or is it supposed to b soft as mush after 15 minutes of steaming? Hi there, it should be soft enough that it can be mashed without much difficulty. Leave it steaming for a while longer if 15 minutes doesn't do the trick. U should buy and try out the yam first. It should be the soft type which the cantonese say 'sung sung'. Are there alternatives to deep frying in oil?Can air frying work? What is wheat starch is chinese? is it mian fen ( tepung gandum)? Hi Natalie, what starch is 澄麵粉 in Chinese. They call it by "tang meen fun" if I'm not mistaken. I found this website online that talks about all different kinds of flours, I hope it helps in clearing up the confusion. 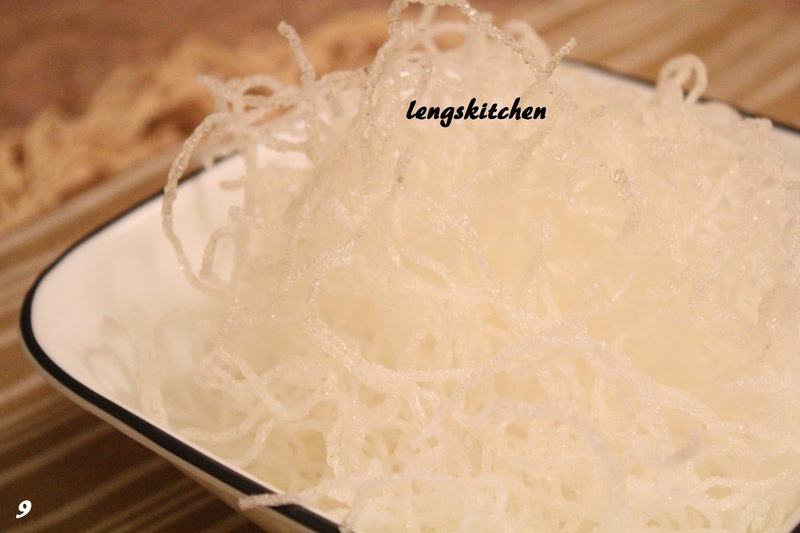 Btw, tepung gandum is not the right one (tepung gandum is the normal wheat flour that we normally use for baking). Hi, no matter how many times I look at the pictures, my brain tells me it's TARO, not yam. Google it. Yam is sweet potato. I cook with both a lot. Hi, if you could look further into the "yam" Wikipedia page under "Other uses of the term yam", you would see that the word was not limited to just one type of yam. Sweet potato (which is not really the true yam btw) is what people call as "yam" in the States; in Malaysia and Singapore - yam is what the people there use interchangeably with taro. May I know if it is a must to use shortening? If so, is there any other substitute? Hi there, I don't think it's a must to use shortening. That said, however, the shortening does give the ring a crispy and flaky texture. You can probably try substituting it with butter instead. I haven't really tried this myself, so I can't really say much about it. Hope it turns out good! very nice recipe. Big thanks to you for sharing such great information. Did you deep fry the taro ring together with the aluminium foil? Hello where can i find the 5 Chinese spice powder?? 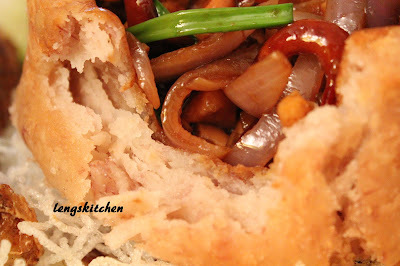 It turned out the yam pastry literally disintegrated in the oil as it keep frying !! Can you substitute the wheat starch with cornstarch or tapioca starch? I want to ask the same question 😅..